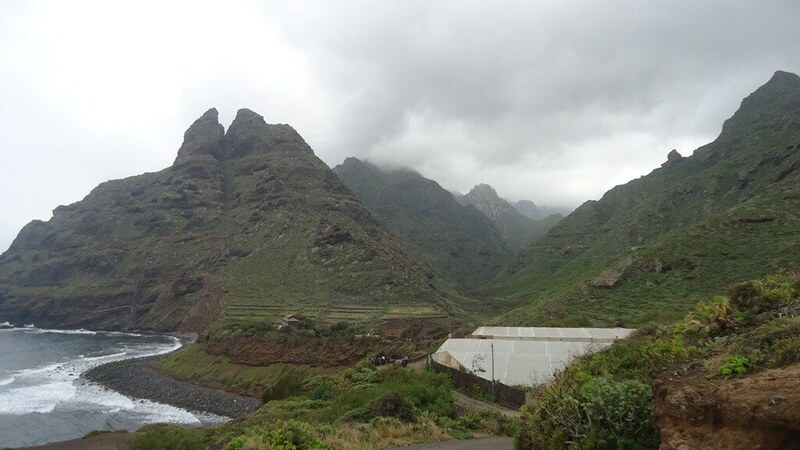 Punta del Hidalgo to Santa Cruz, or the other way around, is a route from coast to coast on Tenerife island. 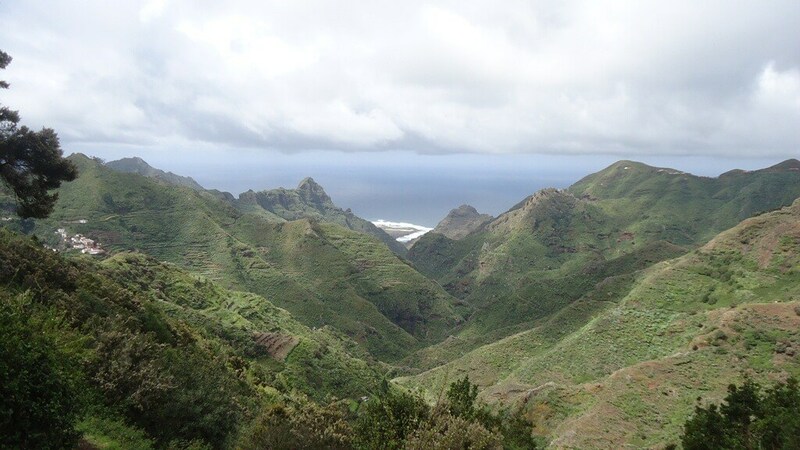 It is about 21 kilometers long and the highest point of the route is approximately in the middle of the route, at Cruz de Taborno, 1020 meters above the sea. 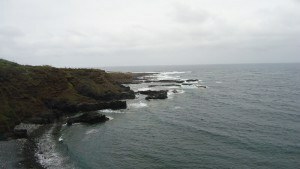 The north side of Tenerife, view toward Punta del Hidalgo. So this is a demanding hiking tour for which you will need around 6 to 7 hours, depending on your fitness. Many technical details are available on the map below. More details are available if you click on the title. The route starts at the end of the bus line, which is completely outside of Punta del Hidalgo town, on its east side. 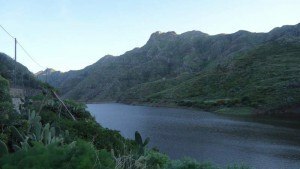 To get there you will take a bus from La Laguna. The route is marked and rather straightforward, you start gaining altitude just a few minutes after you start the trail. 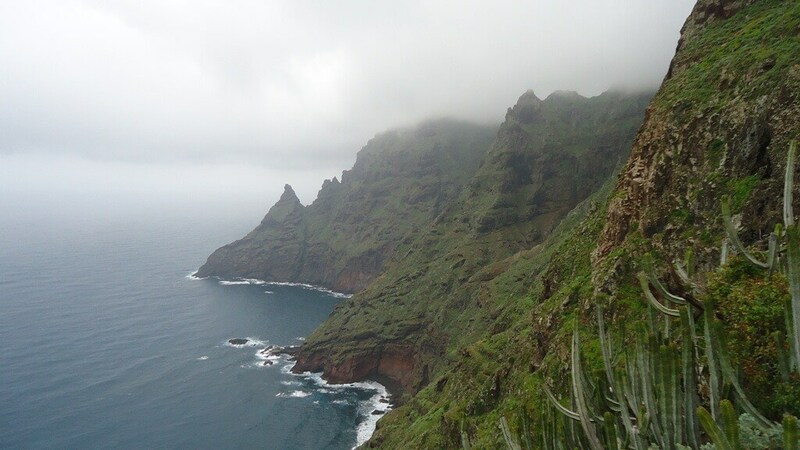 At some point, after about 45 minutes of walking, you will be at the edge of 300 meters high cliffs from where you will enjoy spectacular views of the north coast of Tenerife. The area is volcanic, but green and beautiful. The path is rocky in the first half of the route on the north side. 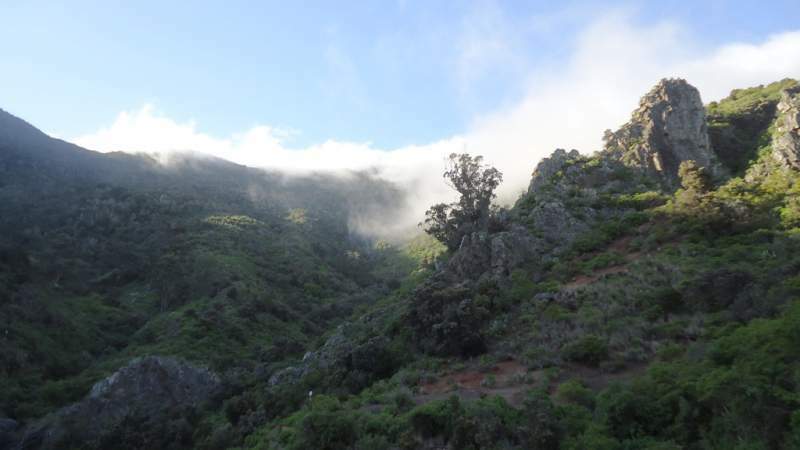 After that, in a short section you will follow the road, and in the remaining part before reaching the highest point of the route it will be a pleasant walk through thick woods and most likely through clouds. 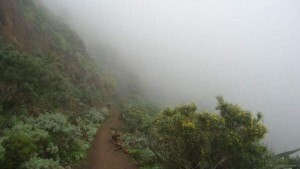 I did the tour in March, and in the upper part of the route, I was walking through the cloud, with less than 20 meters of visibility. You can be wet without noticing any rain. The route goes through this canyon following its left side. 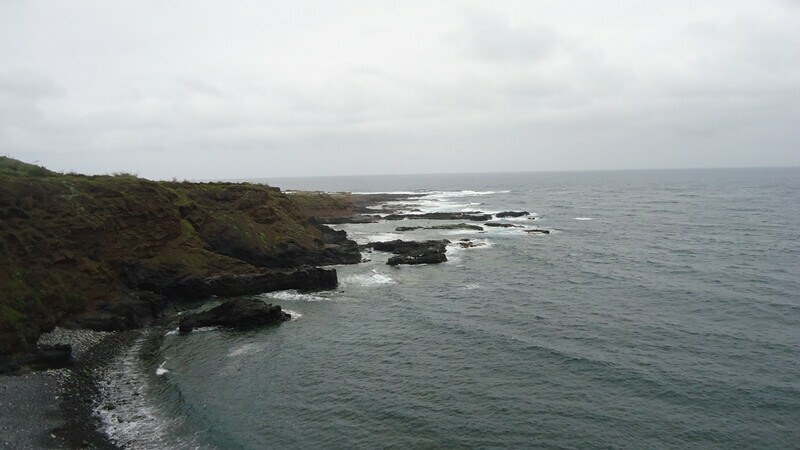 Cliffs of the north coast. 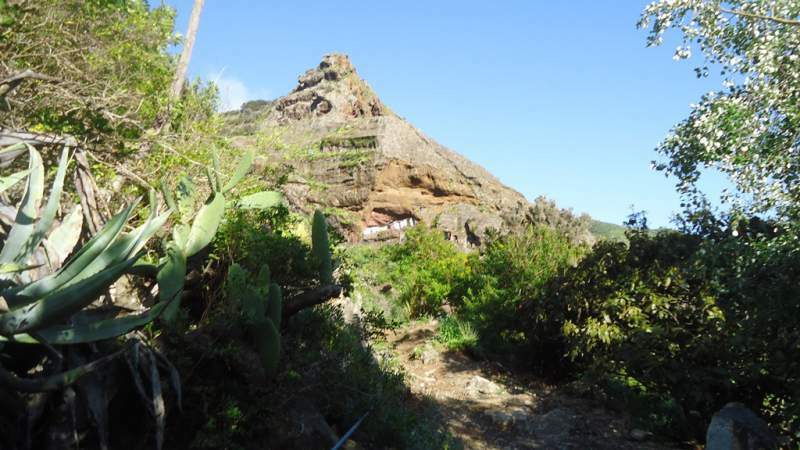 View back toward the sea and Punta del Hidalgo. 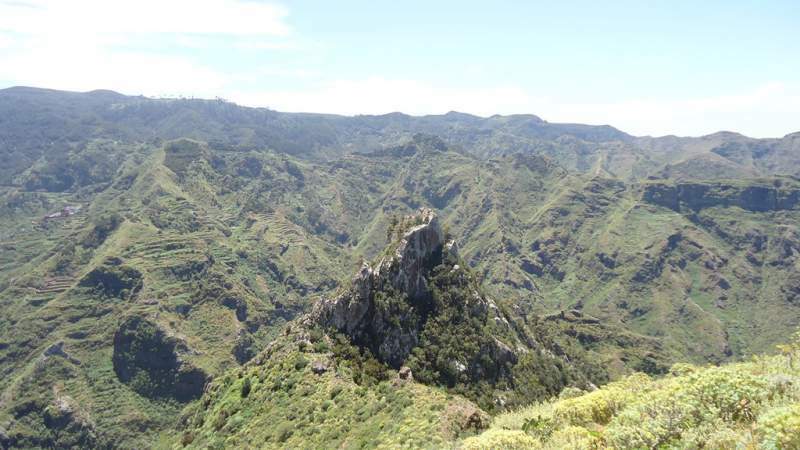 After passing Pico del Ingles (986 m) you will start descending toward the south and Santa Cruz. This will again be first through thick forest and following very pleasant paths. There are several possibilities in this part, at least three routes and they all lead toward the road in Valle Tahodio and further toward the sea and the city, see the map below. 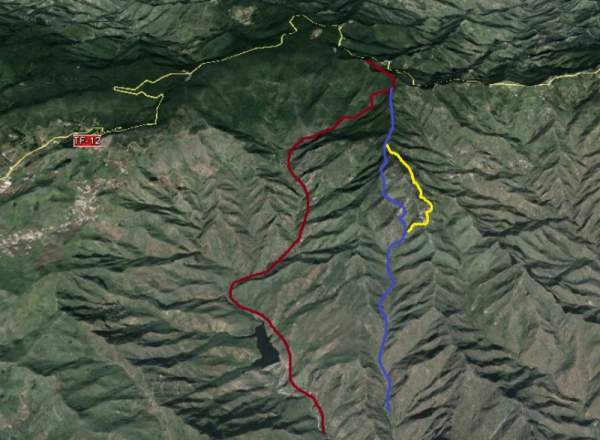 One route (red on the map) is a bit steep in the first part and it descends toward the dam Presa de Tahodio. 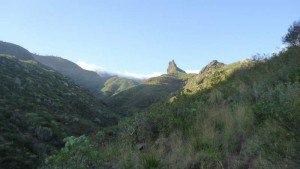 The other two will lead you toward Barrio de Alegria, from where you will descend into Valle Luiz and then Valle Tahodio to join the first route. 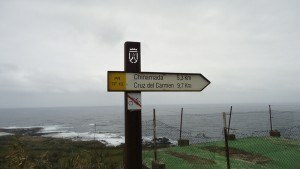 After that, following the road for about 3 kilometers you will be at the sea and in Santa Cruz. The south side of the route, view back toward Pico del Ingles. Cave houses on the south side. View back, the south side. At the dam, close to the sunset, the south side. I walked the route in March 2015 in 6 hours and 10 minutes. It was a normal walk without pushing too much, but without making big pauses either. Just a pair of walking poles and comfortable walking shoes are all you need for this route. I walked the route from the south to the north as well, i.e., from Santa Cruz to Punta del Hidalgo, in a bit less than 6 hours. It was on April 26, 2015, and without any clouds. So here are just a few photos to feel the atmosphere. Valle Luiz which I just passed, the south side of the island. 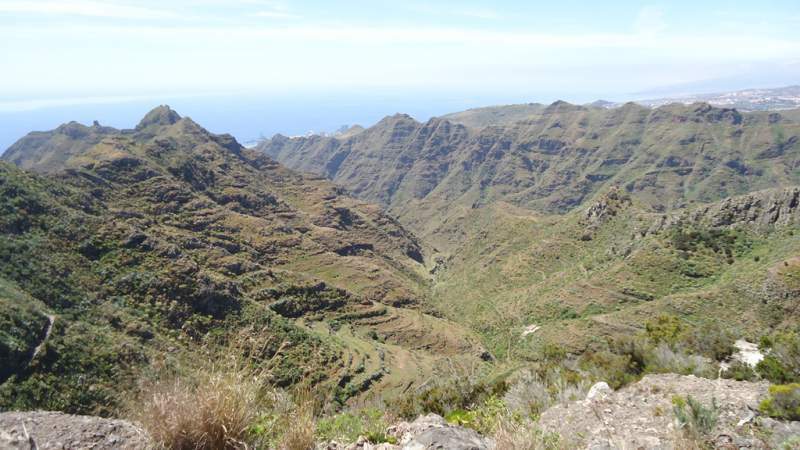 Below Pico del Ingles, around 900 meters above the sea, the south side. The north side on a clear day. 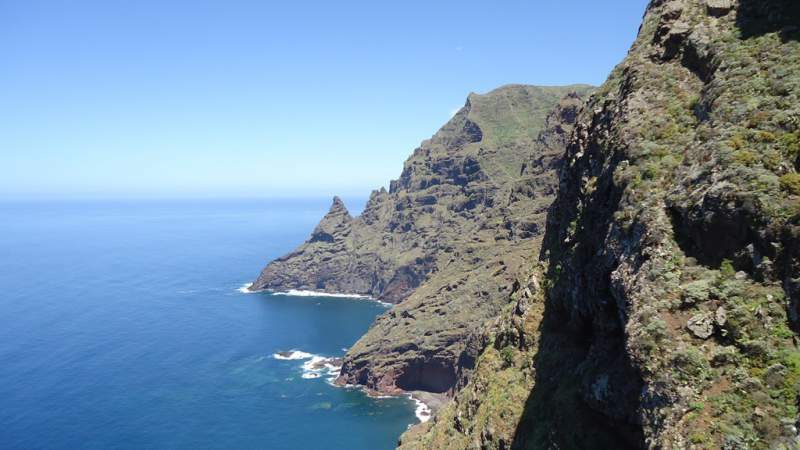 The north side cliffs in full beauty, a reward after 20 kilometers. 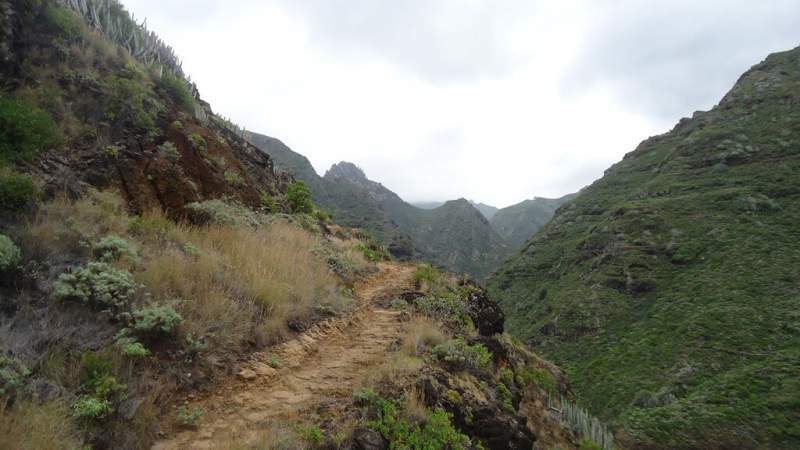 To summarize, Tenerife has a lot to offer to anybody, regardless if it is about hiking or climbing. For the latter please have a look into my pages about Teide, Pico Viejo, and Guajara mountain. If you are more interested in hiking, please see this post on the tour along the north coast of Tenerife. I hope you find the information here useful. Please leave some comments below. Great website! I really appreciate the effort you have put in. 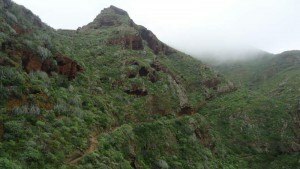 My girlfriend and I will be on the Island in mid January and would like to do some overnight hikes. Is this possible? Do you have any recommendations? Hi Gareth, great to hear from you. You deserve my respect just for mentioning overnight hikes. This is something I have been doing on many mountains. About Tenerife: the best place to do an overnight climb is Teide. I did it 3 times solo that way. Please have a look into this text, and also into this one. 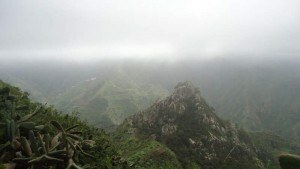 The idea is to be on the summit to see the sunrise, spectacular, you will never forget this. 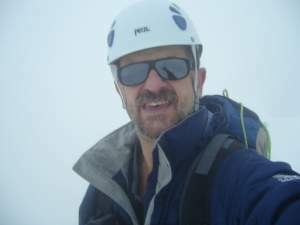 If you want some daylight climb I warmly suggest the route Parador-Pico Viejo-Teide-Montana Blanca. I did it recently solo and tomorrow I am going to do it again with a friend. I shall be happy to assist you if you need details about any of these or other tours. Best luck. 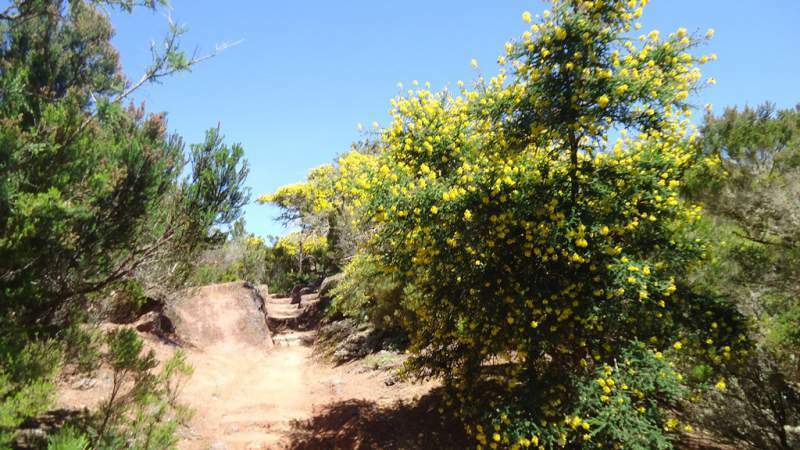 With photos and maps, you’ve done a great favour to bushwalk lovers. I love mountains, more so than beaches, and can’t remember how many mountain in Australia and oversea I have climbed. 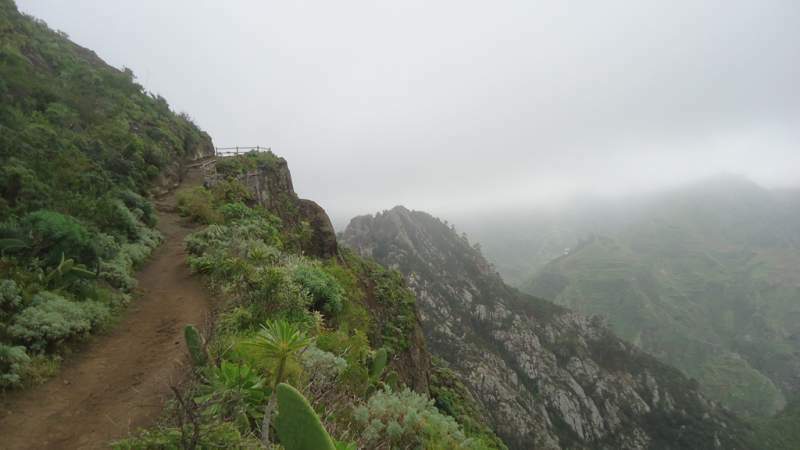 Wish one day I would get a chance to do bushwalking along the trail between Punta del Hidalgo to Santa Cruz in …. sorry, I still have no idea in which country it actually is? Oh yeah, of course. Look, how dummy I was. Spain, a beautiful country. Stunning looking walk, though that path looked a bit dodgy in places. 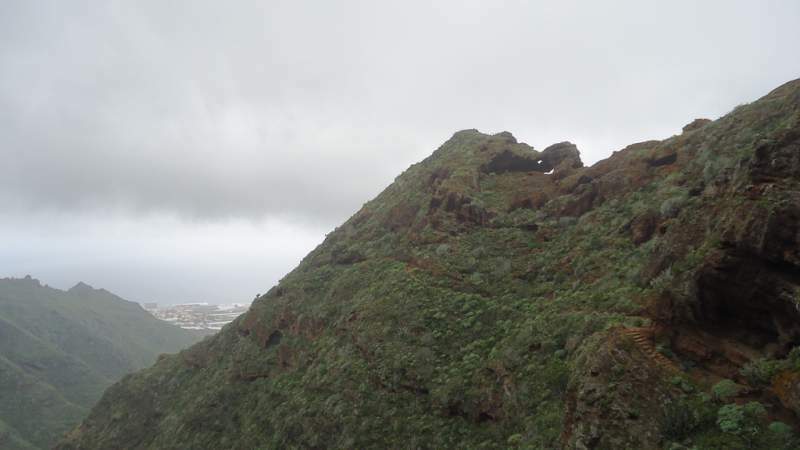 I wouldn’t like to be up there if the mountain decided to get angry. Super photographs and videos. They give a real feel for the place. It looks as tranquil as the backing music. I wouldn’t mind paying a visit sometime. I don’t think I’d be fit enough for the full walk, but I’d like to do as much as I’m able.